Order your Venlo Blue 9 Watch Case today from FahrneysPens.com. Fine Pens, Refills & Luxurious Gifts – great prices & fast shipping. The Venlo Company is the maker of the finest wood pen cases in the world. The breathtaking Blue collection is now available! The gorgeous Blue finish starts with select maple burlwood veneers from Italy. The wood is dyed through a painstaking process to achieve an intense midnight blue color. Many layers of thick lacquer and hours of polishing are required to produce the one-of-a-kind, high-gloss finishes. 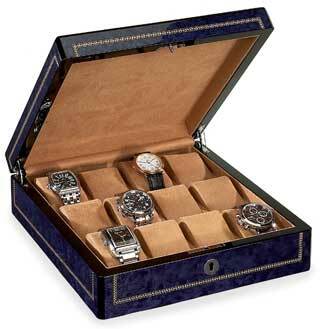 Each case is lined in non-tarnishing suede, with 9 watch pillows that provide ample space. The 9-slot watch case offers brass hardware and a lock and key. Due to size/weight, additional charges will apply on air shipments.